So it’s time for my next review. What have we got? 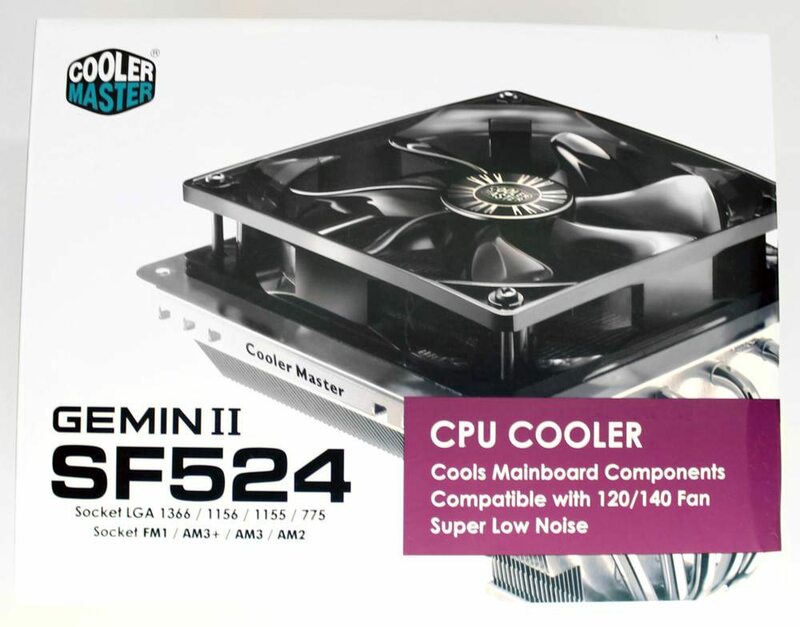 Today it’s the Cooler Master Gemin II SF524. A mixture of high performance and top down cooler. We’ve seen quite a few companies try this style of cooler and they have some real advantages such as being able to cool RAM modules or the VRM area. The disadvantage is that the heat has further to travel along the heatpipes compared to a tower style cooler. Will that affect the results? Only one way to find out. Again we see great box design from Cooler master. It clearly displays the information you need to decide if this cooler is correct for you. 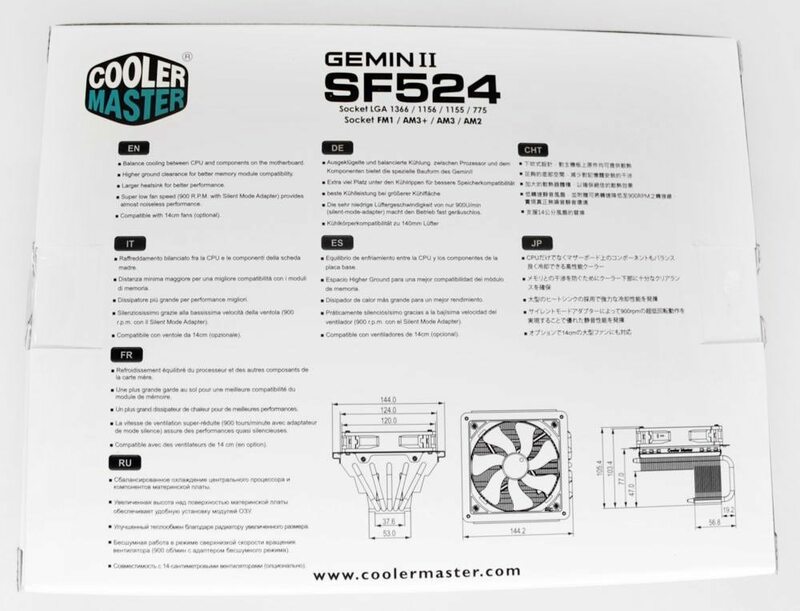 The back has information in multiple languages and some technical drawings of the cooler. 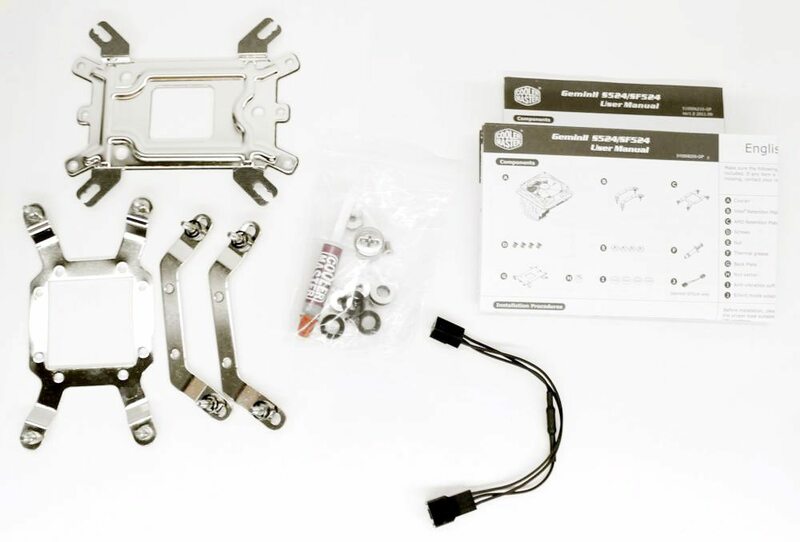 The bundled items include: a manual, AMD and Intel mounting parts, thermal compound and nuts, rubber rings, nut setter and the silent mode adapter. The provided mounting system is another variant of Cooler Master’s mounting solutions. It is the simplest and easiest of theirs that I’ve used so far. The four included rubber rings needed to be stuck to the motherboard to ensure there is no metal contact. The mounting solution for a cooler is becoming more and more important as part of a bundle like this. It’s good to see Cooler Master trying lots of different systems. The thermal paste is the same standard thermal paste Cooler Master provides with all of their coolers. It’s of a high quality and has a good viscosity for a thermal compound, making sure it spreads well when you mount it.